A week ago, I posted about a struggle I've had for the past couple of years, and asked for your prayers. I was overwhelmed with the comments of support, emails of concern, and so many helpful suggestions. I cannot begin to tell you how grateful I am for each and every one of you who reads this blog. You are a blessing to me. I also sent a link to my post to our local homeschool group email list. I was FLOODED with notes of encouragement and suggestions about places I could turn locally for help. So many friends lifted me up in prayer, and I have felt so peaceful for the past week. I felt so much peace that I almost fell asleep in the MRI machine, and if you've been in one you know they are LOUD! Here is an update of what happened after my MRI. Are you ready? Nothing. Yep, nothing. 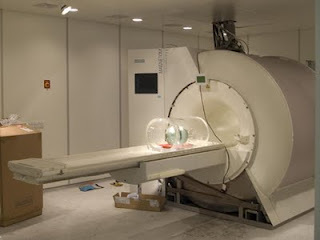 The results showed there was no change in my MRI of 18 months ago. The diagnosis is still a herniated disc (L5 S1 level) and my doctor recommended yet another epidural shot that "might" work this time. I politely declined and now I'm about the business of taking some of the suggestions people have given me. In talking with a good friend of mine, she suggested a women's health/physical therapy center in our area. The center specializes in issues of the spine and also physical therapy and Pilates. I made an appointment and will start visiting them this morning. I know I need to be more diligent about physical therapy and some weight loss is also going to help. I know I need to put this situation FIRST (even above homeschool) right now if I am going to feel better. I had a pow wow with my kids yesterday and explained everything to them. I told them we would be going to physical therapy a lot in the coming weeks. We have a bag they have packed with lots of things to do while we are there. I told them mommy needs to be the best she can be and hopefully this approach will make it happen. I look at this picture of my children and it just motivates me to feel better! Someone left me a comment this week that said "Don't worry about this, girl - He's got this!". So true, isn't it? I thought about that a lot.... God will send me the answer I need. He will use this situation to glorify Him and strengthen me.